I count myself a personal friend of Dr. Paul Hartog, but now consider myself a benefited pupil from reading this book of which he is both editor and contributor. Since we are being inundated in our day with various versions of “ancient-future faith” supposedly gleaned from the patristic era of the church, gaining a clearer insight into that era, and broadening our view of the doctrines and practices of the fathers, will help clear the ecclesiastical air for all of us in our contemporary era. This book makes it clear that much today that claims to discover early Christianity has become lost in the woods. Dr. Hartog introduces and concludes the study and seven other patristic scholars contribute from varying evangelical points of view. Frankly, I thoroughly enjoyed each chapter precisely because I am no patristic scholar and need all the help I can get in understanding that portion of our Christian history. For that reason alone I recommend this book. It encouraged me to broaden my own reading and helped me see how the early church has influenced my faith. 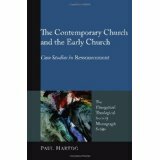 Dr. Hartog greatly complements the various contributors by adding a conservative Baptist view of patristic material. His opening chapter interacts with a variety of ways moderns have used the church fathers, including a consensus view such as C.S. Lewis’ Mere Christianity; Webber’s worship renewal movement; the restorationist or house-church movement; the emerging church, mystery movement; the cultural critics; and the popular apologists like Dan Brown and his Da Vinci Code. Hartog’s final chapter is specifically titled, “Evangelicals and the Tensions of Ressourcement—A Baptist Response.” Hartog uses David Bebbington’s “Quadrilateral” description of historic evangelicalism: biblicism, crucicentrism, conversionism, and activism. Here the author uses a “diachronic” approach (looking at how changes over time have affected each area) and shows how it is too easy for any church tradition to read back into the fathers whatever one wants to see. Hartog refreshingly defends the Baptist, or “free-church,” tradition of always keeping Scripture before human wisdom. Regarding activism, for example, he writes, “At the same time an approach to Christian compassion that borrows from the wisdom of the entirety of church history reminds us that churches have sometimes veered from a Gospel-centered concern for the less fortunate” (p. 218). “It is no wonder, then, that Baptists tend to see the local church (rather than ‘parachurch’ organizations) as the center of biblical activism” (p. 220). This book is important for our current Baptist church conflicts over tradition, mystery, worship, and culture. Hartog says, “How shall we move forward, then? I will not draw a detailed map. Rather, I urge us to pull off at the nearest rest area and engage in unhurried reflection” (p. 225). “Nevertheless, we listen with ears open to the fathers, even as our hearts are resolutely bound to Scripture. In other words, we really do learn and yet retain our distinctive theologies” (p. 227). “The liturgical celebration of Christmas Day on December 25 was instituted at least by 336.” Paul A. Hartog, ed., The Contemporary Church and the Early Church, p. 59.